Happy birthday, ,Tech Support! I’m behind on camp stories. Will have to fix that. 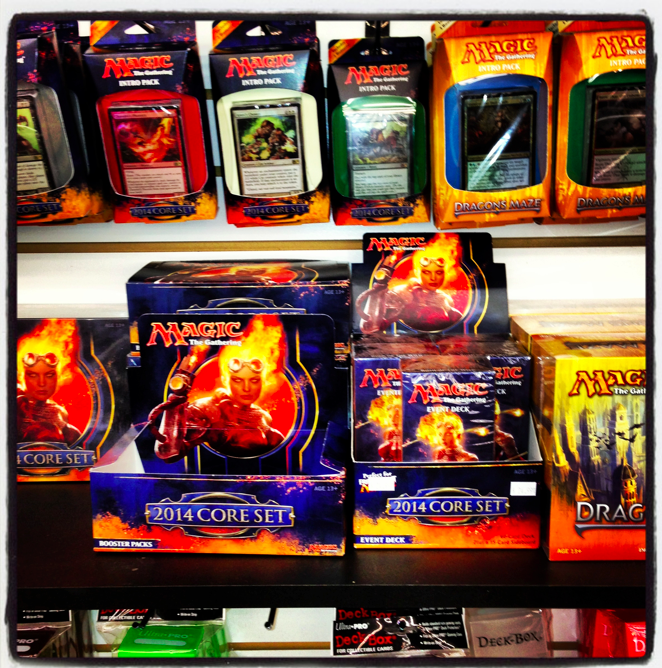 MtG = Magic the Gathering. Totally my bad. Something about the mention of it makes me slip into false code-speak! Just Googled it. And now I feel like saying something like Duh. I think I’m the fool here. Except I just tweeted this post using the hashtag #MtG. So thank you. I never got or asked for anything unusual, unless you count the box of Trojans my mother demanded I take with me on spring break as a high school junior a “gift”. I almost always got what I wanted, but not exactly what I wanted. So when I wanted a Mongoose bmx bike, I got a Team Murray racing bike instead. It’s still a bike, sure, but not what I wanted exactly. Were you my mother, Tech would probably getting a pack of Uno cards in the mail instead of this Magic stuff. The avoidance of an unplanned pregnancy and/or contracting a sexually transmitted disease is the gift that keeps on giving!!! She may have been prescient as I did rendezvous with my first ever tattoed woman right there in Ft. Walton Beach! It was a tramp stamp before anyone called them tramp stamps. I was seriously worried that I was going to get AIDS (AIDS was big back then) but not worried enough to just roll over and go to sleep I guess…Teach your boys better, ladies! Lol. Yeah.thats about what I was thinking. Oh my god, I would have died. DIED! It’s like with Christmas, since my kids are all about waiting to tell Santa what they want. 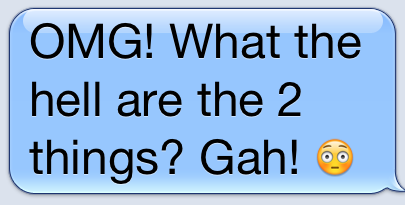 And then I have to work some Jedi mind tricks to get them to let me know what they told Santa! It’s a lot of fun, as you can imagine. :-/ Happy Birthday to your boy!! Or should I say, your young man. (Oh god, now I feel like a grandma). Hope he has a fabulous campy celebration with chocolately goodness!!! I hope my kids are math lovers. You’re a good mommy! I read a little bit about this game, and it actually sounds pretty solid from an educational standpoint. I mean, he isn’t plugged into a game system and he’s interacting with other humans while he’s playing. Also, he’s using his imagination and having to think creatively and critically. Not too bad for a card game, right? I was Student Club Coordinator when in University, at which time a group of students approached me about creating a Magic: The Gathering Club. I helped them to get it off the ground, and it ended up being one of the best clubs on campus for getting students involved because it got the loners and students normally on the outside into a club where they were able to socialize and really feel involved. I love card games like these because instead of staring at a screen, kids are actually meeting together and socializing face-to-face (minus the interloping cards!). Hi Trit! I’m so glad you chimed in. I totally get it. This game is a great way for people to be social — and you’re so right. While playing, people are engaged and using their minds creatively and critically. I’m not surprised my son gravitated to this kind of thing; it’s right up his alley. I’m just surprised I’d never heard of it before since Magic has been around for over 20 years. How cool that you were involved with setting up such a successful club and your college. I have to say, it sounds like many of the boys in my son’s village are LOVING Magic. It’ll be interesting to see if he’s able to continue to play once camp ends. Now that’s a game I know how to play. Plus the game is to lose, right? IYKWIM. It’s pretty easy these days for me thank God, the girls just usually want like the treat of a manicure (which unlike other girls is not a regular thing for them) and the boy just usually wants money to spend at college… or maybe a cool shirt or pants. But I remember the days when they were little when it was like “I want a pony” and I’m all like “No”. no real unusual gift requests here.. but love card games. I learned, or relearned, how to play Gin Rummy this summer – my daughter and I played it and had a blast, she has learned how to play, ruthlessly. Son was watching and picked up on it quickly – cards are fun and it gets them engaged socially. If you speak to Tech Support wish him a very happy birthday. Happy you could figure out what he desired. Thanks Mom. We did our best. We have some other things to get Jim when he gets home, but that oughta hold him for now. Maybe. I think he may have mumbled something to me during intersession, but mostly he was relying on my amazing powers of ESP. Hopefully, we did not disappoint. My older boys were the right age for the Pokemon phenom. I became quite the expert at learning the codes on the packs of cards so I could pillage the stock at ToysRUs so u could get the good cards. After Katrina I gave them all to Goodwill. Still kicking myself for that one. I guess you were *that* lady. Live and learn, right? My first thought was he wanted Pokemon cards, that’s how far out of the loop I am. Happy birthday to your child/man, and may all of his future wishes be so easy to grant! Yeah, Pokemon is so 2008. You’re so 2000 and late. Actually, I think it was much earlier than that, but I went for the rhyme. Tech comes home in about a week, and school starts the first week in September. But he has Freshman Orientation the last week in August. Right before he gets his braces. I’m sure a post will follow. Happy birthday Tech! I bet he had to skip around the room while they sang Happy Birthday. 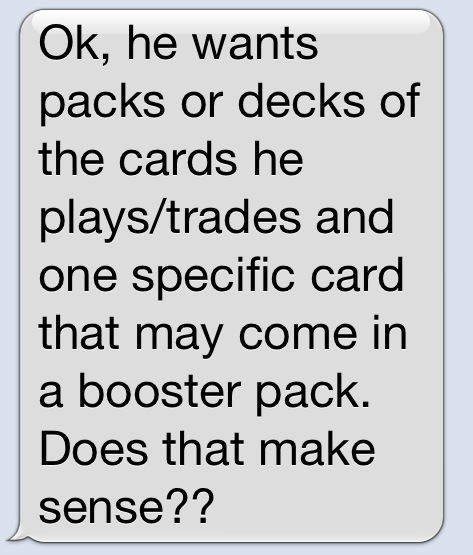 And I love that he is into a new (to him) card game. Enjoy your last few days of quiet because the I know you will enjoy the many days he’s home until next summer when he’s gone over seven weeks – in Tusc!! Boots: I found out it was a village day, so he was out of camp all day. We actually got to speak to him tonight for his birthday phone call. He sounds great. He was psyched that it was not a rush-rush day, but a kind of “chill” day. They went to someone’s house for a BBQ: his kind of day. So I guess he skipped the skipping. Secretly, this mom hopes he’ll still get the chocolate cake. I can’t believe he’ll be in Tusc next year. Weren’t we just there? Oh, wait. That was 1982. Time flies. It does. I’m not gonna lie… I used to play Magic. And I turned out just fine…. Magic, huh? I only hope that’s the game my own little math geek wants to play with cards. Anything to keep her off the pole. 😉 Happy birthday, Tech! Sam’s birthday is a summer one too so I know I’ll be in this position one day. Loved reading how you handled it. I’m sure he had a great day! And I’m sure he knows how much you guys love him. My kids are all about pillow pets these days. It’s a little kid rage. I’m super impressed with your investigative abilities – good work! It sounds like a fascinating game, and I hope he gets a lot of enjoyment from it, and you from that. It wasn’t easy and also, I um…got it wrong. I saw him on Saturday when I was involved with a small program with some of the oldest campers. Well, let’s just say, he told me that he wasn’t really expecting anything. 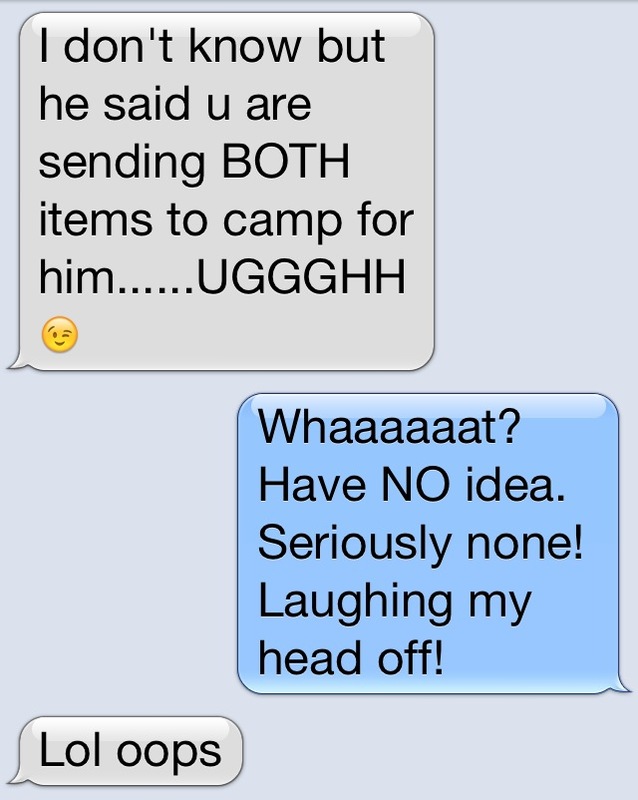 He just said something to his aunt so that she believed he was getting ‘something’ for his birthday at camp. He said he knew that we would celebrate when he came home. Can you believe? All that scrambling around? For what? He was still appreciative though. He just said we didn’t have to get him anything. What a mensch, right? Also, I got the best hugs during Havdallah. Le sigh. Can’t wait until he comes home on Thursday! Renee, I was sure the two things you were already giving him were “love” and “camp.” That would have been too mature for a 14-year-old though. Glad it was Magic cards. Well, THIS brought back memories! My son (now in medical school) went through a serious Magic phase… and of course I too learned everything I could. AND I’m going to talk to him about checking his cards to see if any of them are valuable….because I think that may give him another idea of how to use those cards now –he has MANY! Definitely check! Some of those cards are worth a fortune! Cha-ching.